The summer holiday period yielded a lot of driving, just not in the Speciale. But now I can safely, yet very subjectively, state the following: the new Mercedes S-Class is amazing yet boring; a Porsche GT2 RS laugh-out-loud hilarious when the turbo is on full boost; a V12 Zagato a beauty to behold while chasing it on the track; and Tiff Needell can really drive. Enough of that stuff, back to the ‘Fiat’. 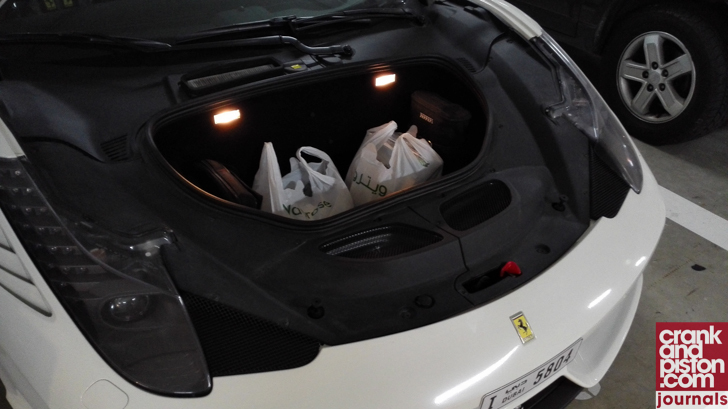 Upon return from our holiday in Europe, I dropped the car at Al Tayer for some well-deserved tender, love and care. Even though there was no warning light related to the brakes visible just yet, the relatively heavy use on both road and track made me want to replace the Brembo-branded pads. And the tyres needed replacing too. Being semi-slicks and thus made of Michelin’s super-soft and ultra-sticky Cup 2 rubber, the frequent cornering abuse – plus Dubai’s high temperatures – had worn them down drastically so new boots were ordered. Finally, I had asked Al Tayer to do a full interior (inside area and engine bay) valet, simply because I hadn’t bothered to get that done since I owned it. Whilst they started their work, I was handed the key to a new California-T demo to keep myself entertained for the afternoon. That gave me the opportunity to experience the route that Ferrari was forced to embark on: turbo-charging. You want my subjective verdict once again? Impressive power, virtually lag-less delivery, but missing some of that soul and drama, both in terms of higher revs as well as higher pitch that everybody expects from a Ferrari. Knowing that the 458’s successor will get a turbo-charged engine too, I’m going to hold onto this car for a long time to come. 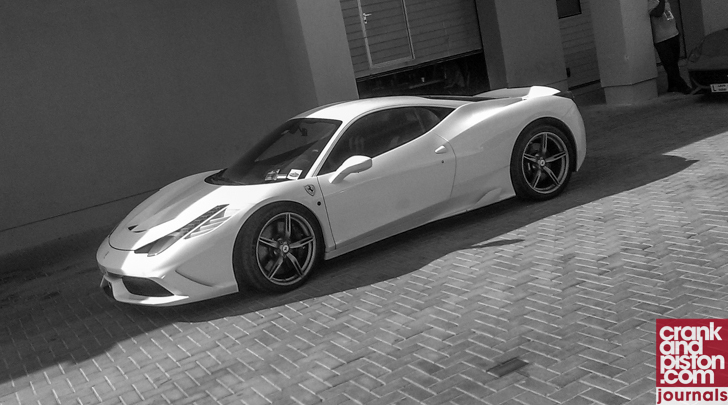 A couple of days later, the Speciale was ready for pick-up. The bill showed no real surprises, yet totaled an amount that would buy you an entry-level supermini easily. Luckily, I have no ambitions to own one of those, so I spending $6K on a set of brake pads (I figure that’s the downside of sharing these pads with the $1.4M+ LaFerrari? ), $3K on a set of tyres and another $400 on the full valet cleaning didn’t shock me. Please remember that such a service is not symptomatic to the standard Ferrari ownership experience, I know of multiple 458 owners here in Dubai who have clocked up 15–20k km and are still on their first set of brakes and tyres. 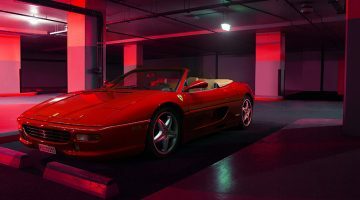 So, it’s just a part of mine, which is characterized by driving the car in the way that I think a Ferrari should be driven. And with that, I’m happy to accept the consequences. All the joy and smiles that my passengers and I accumulated while doing so was more than worth it. So, the car is re-born. The summer is over. Well, the vacation part of it at least. Unfortunately, the ambient temperature doesn’t seem to be dropping just yet. But that’s not going to stop me anymore. I’ve missed driving the Speciale properly over the last couple of months, so it’s time to head out to the mountains this weekend. More on that in the next report.